This entry was posted on December 13, 2016 at 11:58 pm and is filed under Uncategorized. You can follow any responses to this entry through the RSS 2.0 feed. You can leave a response, or trackback from your own site. If only it would happen. Trump does not give the impression of one who seeks innovation or one who would spend for the research to would foster it. Is there something else at work? The trend is against it. Does he really want America to be “great” again? Send the idea to Trump, please! He needs all the help. Really. Maybe that’s what he is doing? Wild thinking? Thinking all over the place? Do you think the guy makes any philosophical sense? I agree with most of what you wrote. Unfortunately, for the state to support advanced science, you need politicians who appreciate what it can do. Only too many politicians are rather shallow thinkers. Yes, indeed: politicians are shallow, because, as it is they thrive on lies. And so does the entire machinery they depend on. The Muslim prima donna who had claimed to be assaulted by men screaming “TrumP”, who, she said, stripped her “Hijab” (a vain attempt to hide the apparently awful body of the Muslim woman), was obviously lying. However all the pseudo-left ran with it. Finally she fled from home, but has been arrested for false testimony. The massive lying in politics and economics set a monkey ambiance adverse to proper inquiries, including of the scientific type. Wild scientific progress ALWAYS depends upon a wild thinking mood: Aristophanes was outrageous because non-Euclidean geometry was invented at the same time, and reciprocally. The mood of thinking outrageously has to be overall, bathing all minds. This is why innovation is always concentrated in space and time, but then, when it happens, it happens all over the mental world. 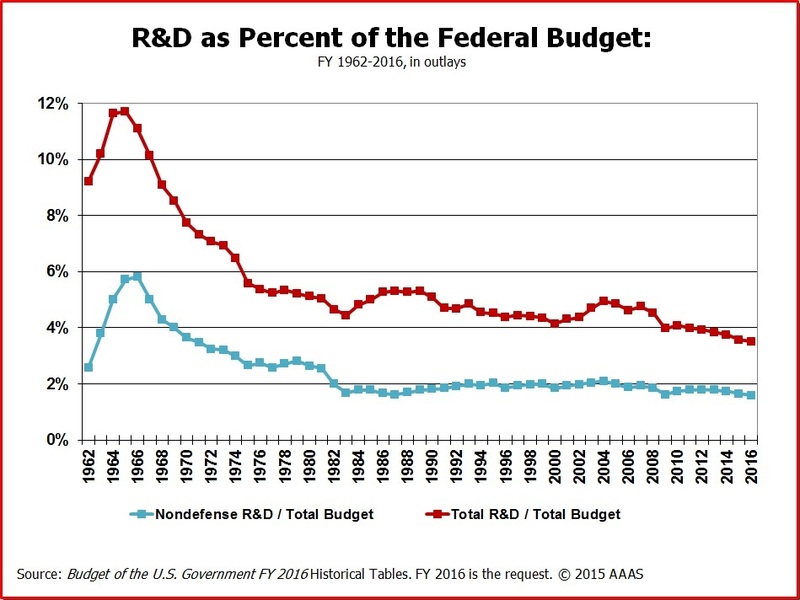 The 60s bubble on chart of US civilian R&D looks like the moon program. Tiny increase before 1980 probably Carter’s energy research before gutted by Christian lunatic Reagan. Basic research funding dropped under “Communist” witch hunter Nixon and the unelected Gerald Ford, but it was not re-established by Carter (of course: Carter was a bad man, an attacker of Afghanistan… A support of the Shah, and Islamist Pakistan…). Notice that, under Obama, fundamental research spending in basic energy research was cut, BIG time (in basic fuel cell research, although fuel cells are crucial for a sustainable economy; and in thermonuclear basic research, not just ITER, but also internal US H research…).Obama just funded cancer research big time, but it’s all too little, too late: basic research funding under Obama is the lowest ever, period. History and logic support your position – so it comes as no surprise that this truth is lost upon so many so-called intellectuals and academics. Culture is the key to understand the life and death of civilizations. Prevailing wisdom (in some circles) doesn’t acknowledge that some cultures are better than other cultures, which is really arguing that no idea is better than any other idea. We can’t risk hurting anyone’s feelings with hierarchy. For decades, the values and institutions that allowed for the openness, creativity, freedom and tolerance of the west (and I really mean the Anglosphere + France) have been attacked by leading elites within our own societies. You see the destruction at every level of society: interpersonal relationships, families, communities and the nation state. There’s a delicate balance of trust that lubricates our social machinery and allows not sophisticated and complicated activity, but also necessary transgressions that embrace the best of our values and push them further. There is a role for radicals. Stasis is death. Now, the prevailing ethos is only destruction fueled by ignorance and self-loathing. The open radical has been replaced by the conformist radical. The innovation that we hope for – regardless of who is president – will be difficult with schools that do not produce creative thinkers. Worse, the very concept of science has been attacked by some: A few months ago a female-hating feminist professor claimed that STEM programs were sexist as they reflected the approach of the male mind. Ask the teach leaders who met with Trump (or even the cowards who refused to attend) where and how America achieved technological supremacy in the last century. I suspect the answers will be mostly incoherent. I’m babbling about the cultural foundations of innovation, but I think they matter just as much as explicit state support. Both have been endangered. Trump certainly has the ability and appetite to make STEM a priority. No organization can fund pure research like the government. If we don’t, China will gladly take the torch from us. I am most optimistic about the inclusion of Peter Thiel. He’s correct when he says that most innovation has been happening in software because the world of bits has become easier to work in than the world of atoms because of state mismanagement of that sector of the economy. We will not soon be rid of the world of atoms. Many of Trump’s core voters (Trump Democrats) are men and women who work (or worked) in the world of atoms. Let’s make the world of atoms work for them again. The leading “intellectual” elite was paid to support the plutocratic “esprit du temps” (Zeitgeist, spirit, mood of the times). That was their number one mission. So they destroyed. It’s not that they just supported greed (“Free markets”, global trade). In countries such as France, they could be “Marxist” (Althusser, or the now second famous Slovenian, Zizek is an example)… Even nihilists such as Foucault were part of the demolition… Him and other senseless French philosophers (example Derida). We will see what Trump does. The radicalism of Reagan-Thatcher is that they saw almost no natural role for the state. They had a transformative vision, wishing to move us from a market economy to a market society, where very relationship is transactional. Perhaps this an unavoidable. That every great civilization will ultimately attack both the foundation of its value and the engine of its creativity, ultimately losing both forever. The values of the golden ages of Greece and Rome can and will never be magically restored to those nations, which is why we look to neither today for greatness by any measure. I agree that Obama’s environmental policies have been nothing but sound and fury. There’s a lot of anti-science religious thinking in some environmentalist circles, including those Obama has supported. Virtue signaling (driving a Tesla, etc) and atoning for environmental (buying carbon offset, etc) matter most. Real environmental progress will come from the same place it always come from: Technological progress that renders fossil fuels expensive, inefficient and obsolete. Jane Jacobs makes a clear distinction on these in Systems of Survival: Guardian vs Commerce.